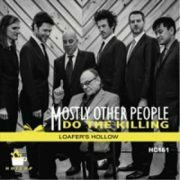 Mostly Other People Do the Killing: "Loafer’s Hollow"
The cover of Loafer’s Hollow closely resembles that of Red Hot, Mostly Other People Do the Killing’s album from 2013. Bass trombonist Dave Taylor sits in front of the other six standing members of the band, who all look amused, shocked or puzzled. The pose isn’t self-parody but rather another of the band’s riffs on a jazz portrait—Jelly Roll Morton’s Red Hot Peppers, though Morton looked like he was dispensing wisdom while Taylor looks like he wants to finish reading. The image reflects a continuation of the previous album’s concept, taking on early jazz, in this case the music of the 1930s and ’40s. As on Red Hot, the group expands to a septet, adding Taylor (bass trombone), Brandon Seabrook (banjo) and Ron Stabinsky (piano) to the core of Jon Irabagon (tenor and sopranino saxes), Moppa Elliott (bass, compositions) and Kevin Shea (drums). Steven Bernstein replaces original trumpeter Peter Evans. The blend of instruments captures the sound of that era authentically, with Seabrook’s bright textures adding to the ambiance in particular. At the same time, his approach to the banjo also involves rapid strumming and electronics that add freewheeling flair. Bernstein proves to be the perfect successor in the trumpet chair as early as the opener, “Hi-Nella,” with a speedy, wheezing solo. As if postmodernizing ’30s and ’40s-style jazz wasn’t conceptual enough, five of the disc’s eight tracks serve as tributes to authors ranging from James Joyce to Thomas Pynchon. Extended horn technique, various mutes, stride piano, quotes from “Mercy Mercy Mercy” and Huey Lewis hits—all of these can be found somewhere on Loafer’s Hollow. And Elliott doesn’t introduce them in a know-it-all jazz-geek way, but in a manner that proves how disparate elements can be compatible and humorous at the same time. With each album, his reach gets deeper and more convincing.